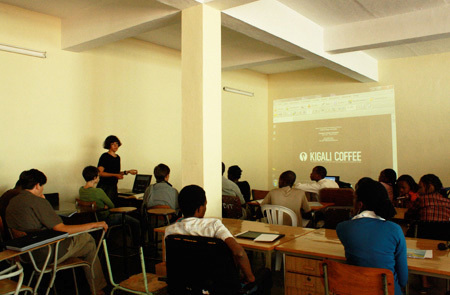 The design students, this morning, went to KIST for an exchange experience with the students of the design departmen. 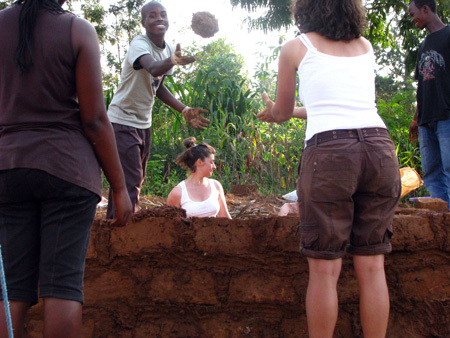 We presented our works and we set together to speak about the projects they are developing in this trimester. 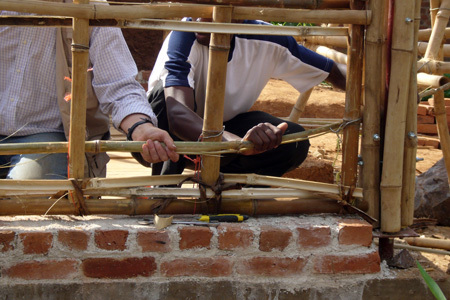 Testing local materials and reviewing traditional construction techniques. 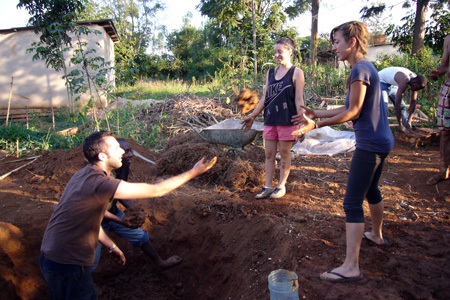 Learning by doing. 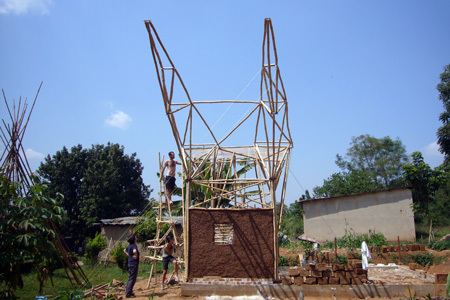 This is the starting point of Atelier Rwanda Workshop 2010. 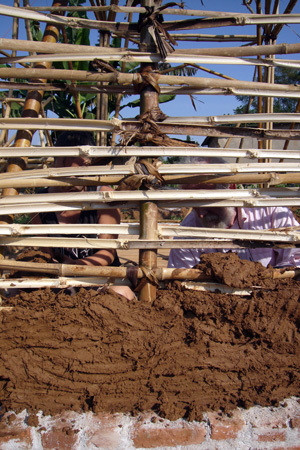 We researched several themes as bamboo, earth building, construction, tamping, dye colors, textile and natural fibers. 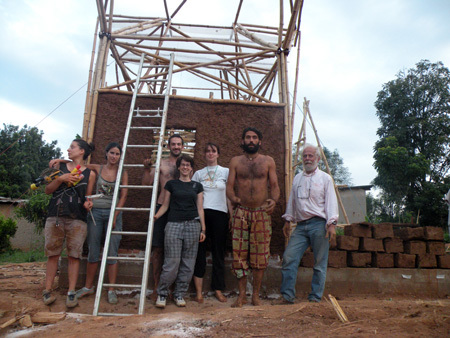 The construction site started on May 17th with local workers who made the excavation and the foundation with concrete and than the students realized the bamboo structure based on the drawings made during the previous workshop in Venice. 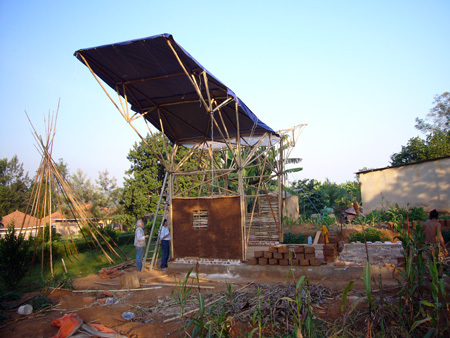 Building the structure lead us to rethink some of the original design solutions. 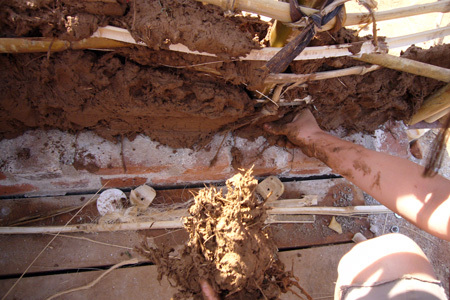 The side walls framework was tamped with the wattle daub infill technique , and the roof was covered with plastic sheets. 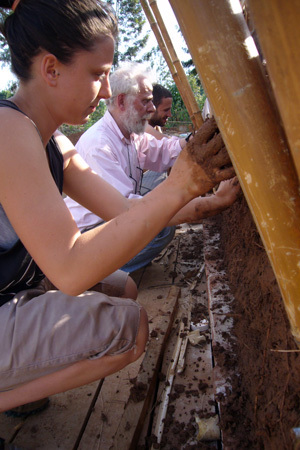 The wattle daub infill was suggested since it was present in the local buildings. 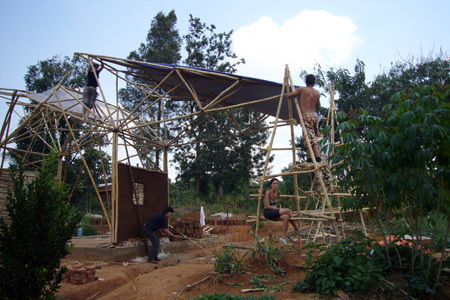 The technique is based on a bamboo framework structure filled with a mixture of earth and urguiri (local grass).The framework was made using weaved bamboo surface. 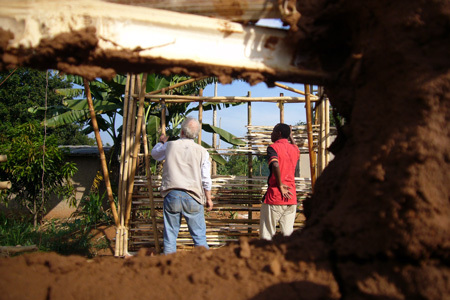 After building the first wall we decided to create the second wall framework with a more dense weaved structure. 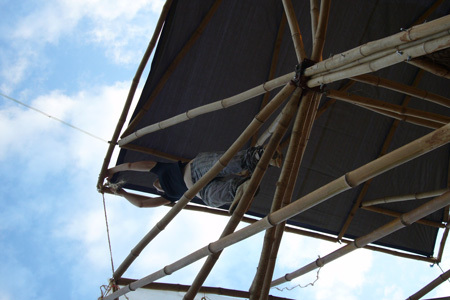 The bamboo which was used for the structure was not properly treated due to time limits, therefore it got deteriorated. 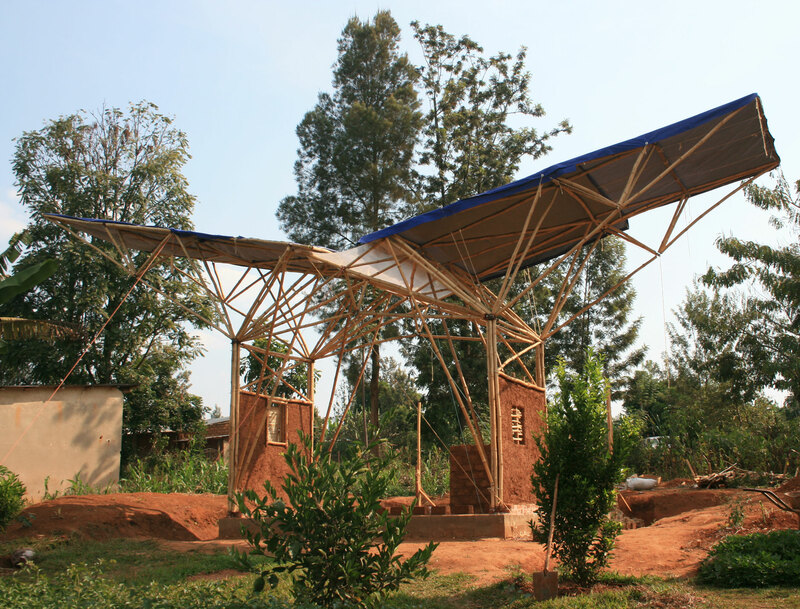 Because of that we decided to use a lighter material as plastic sheet, instead of metal sheet used in Rwanda for most of the buildings’ roof. 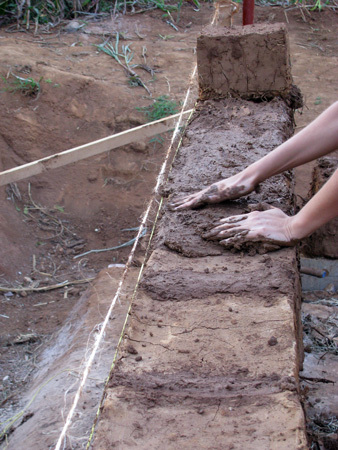 During this last month of the workshop we’ll keep on experimenting with earth construction techniques and rendering of the walls. 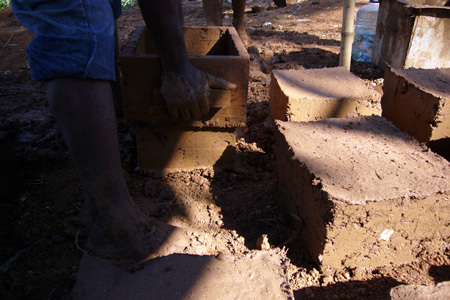 We realized that the buildings made with earth are associated to poverty, therefore this technique is rejected by those who can afford concrete and brick housing. 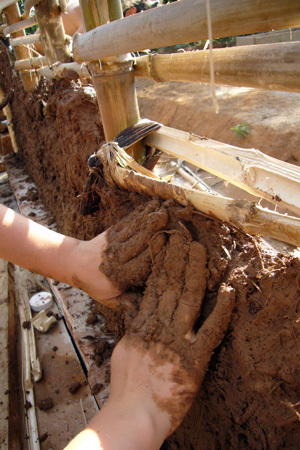 We’ll work on improving the soil mixture combining it with natural fibers to increase its resistance to compression, and on the wall rendering in order to give a new look to the earth buildings. 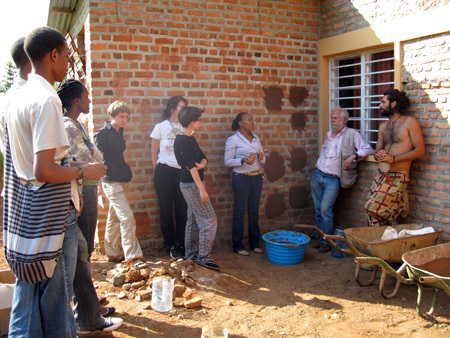 We are planning to try different wall decoration, applying the Imigongo (Rwandan traditional decorative technique) on the inside walls, and using wooden stamps, inspired by the same technique, on the outside walls. 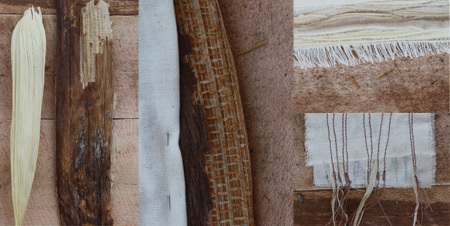 At the same time a part of the students is developing design projects based on the research of natural fibers and textiles. 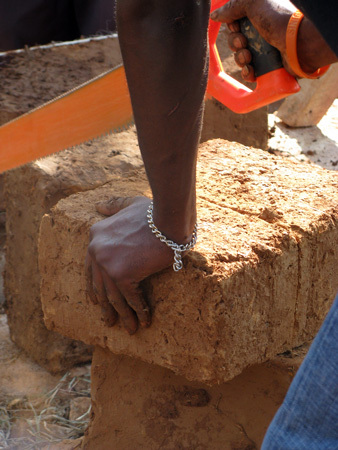 This project is dedicated to the local tourist market therefore we started by observing sales points, objects, design configuration, techniques and material choices offered by the different artisans. The souvenirs in these tourist markets are a mix of imported merchandize and local artifacts and we soon realized that the local textile market is based on sewing technique of imported fabrics and there is no actual textile industry. 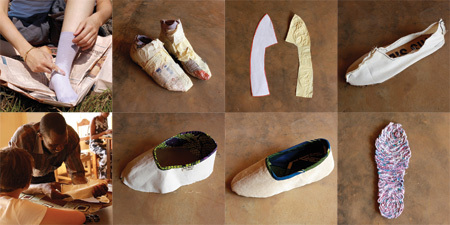 Nevertheless we saw a big potential in working with textile since the techniques are relatively available and extremely creative. 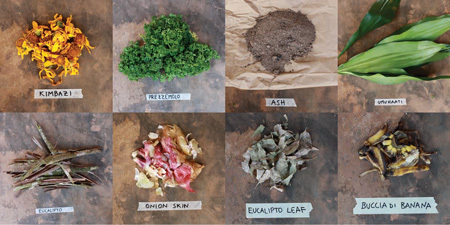 we are currently researching natural dyeing processes and experimenting with local plants, flowers and other materials to extract colors from. In the upcoming weeks we will refine our dyeing process, define the suitable ingredients and will explore ways to print on the textile. 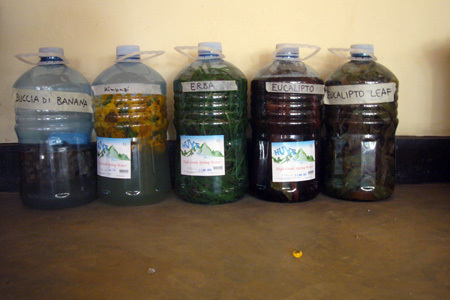 We are currently searching for local plants, roots, flowers that we can extract color from. 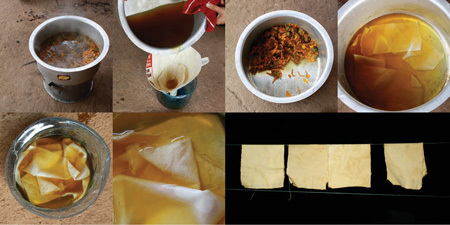 In these images you can see the process of extracting the color yellow from kimbazi, a local flower, and some first dyed samples. 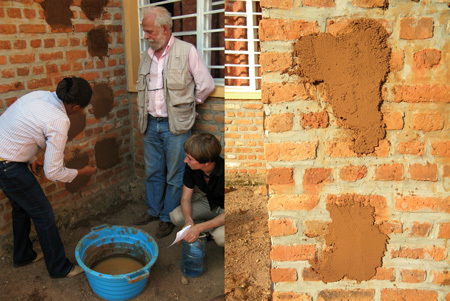 Last week we did the adobe wall together with kist student. 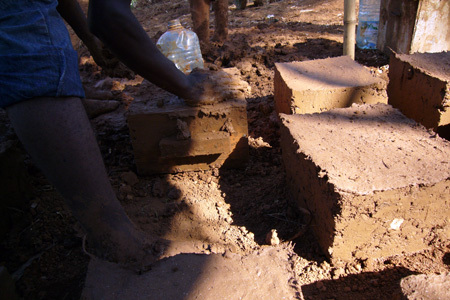 We used the adobe briks that we did a few weeks ago, and we used soil as mortar. 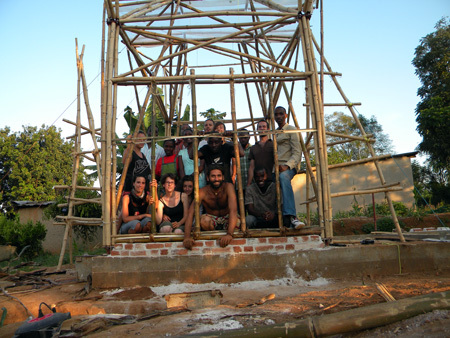 Yesterday we finished the structural part of the last wing. 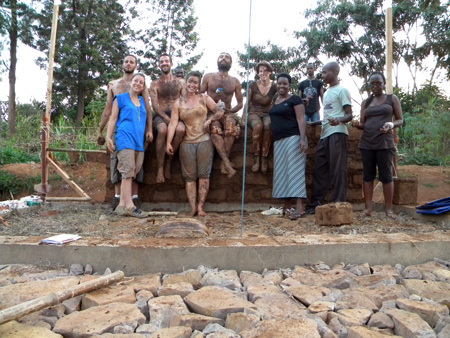 We finished also the second torchis wall with kist students. 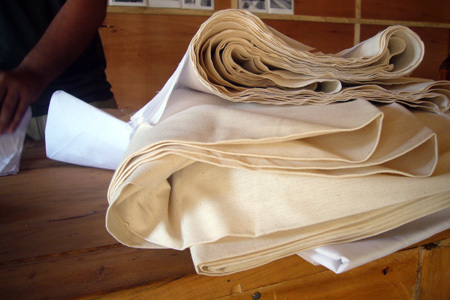 The design group is doing experimentation on fabrics. How to dye it with natural colours. Today we finished a wing of the roof! 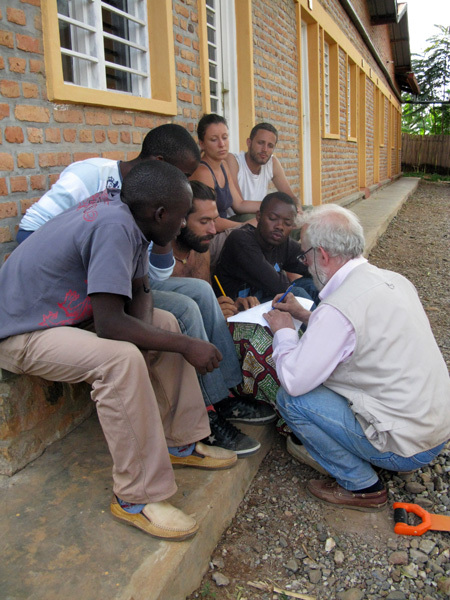 Yesterday we worker with the kist students on the torchis. 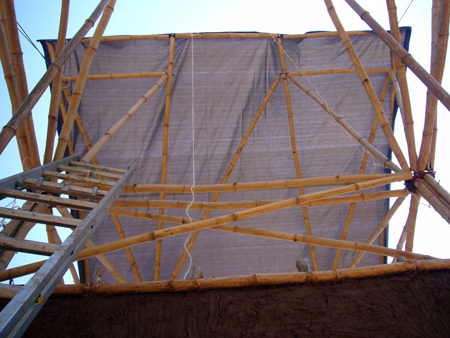 Today we try the roofing, we bring down the wings and we put up the plastic fabric to see the dimension and how to fix it to the structure. 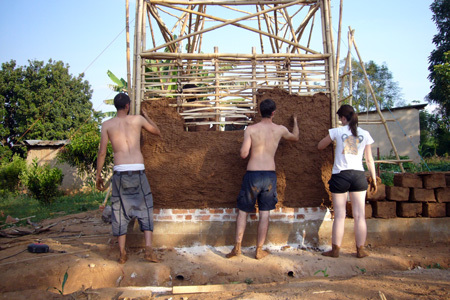 Today we made the first wall, with the torchis tecniques. 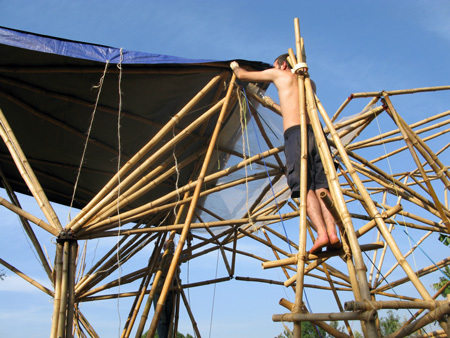 This tecnique has one vertical structure and a horizontal structure made in cutted bamboo. 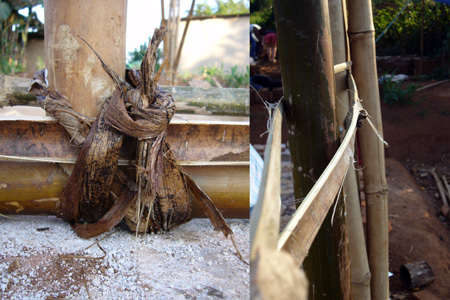 The bamboo are attached either by nailing or tying. 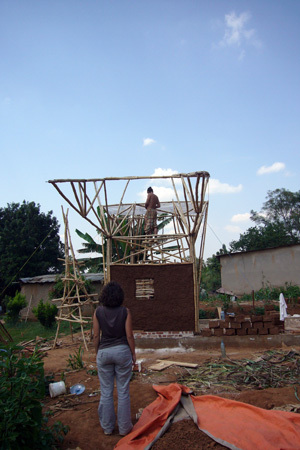 The laths function as a formwork for the earth infill. Yesterday arch. Armando Barp and arch. Maria Rosa Vittadini arrived at Centre San Marco. 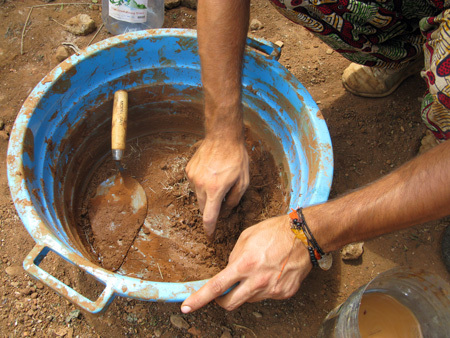 We realized different kind of plaster, some with soil and vegetables fibers others with soil and sand mixed in different parts. 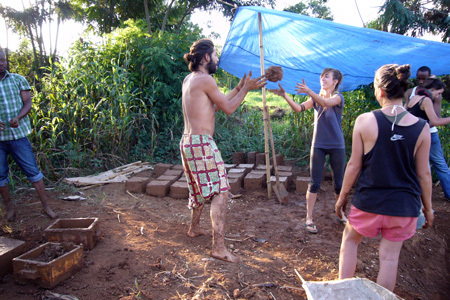 We burned some banano leafes and some bamboo wood to have ash, because we would like to mix it in the compound for the adobe bricks to see if they become stronger. 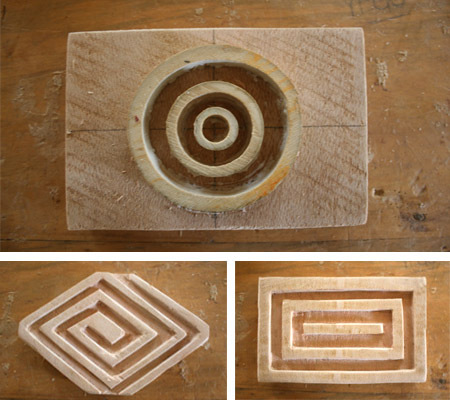 We worked with Kist student on many different things. 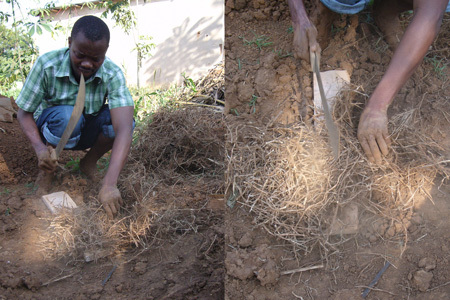 One group realised adobe bricks with several components, some with chipboard, some others with roots and dry grass. 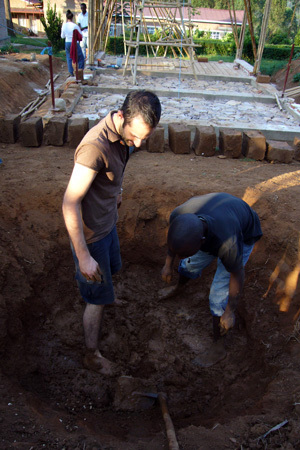 It’s so funny to mix the soil with the feet! 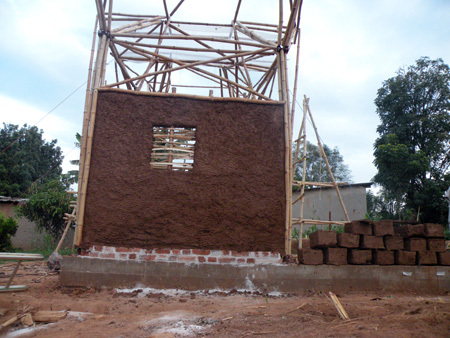 The mulding is done after that a part of this compound is put in a square brick. 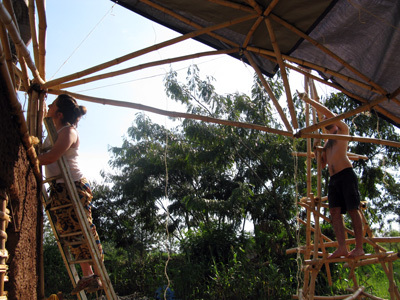 Another group worked on the realisation of the main structure (vertical bamboo) and on the secondary structure (cutted bamboo weawed) of the torchis. Another group thought about the torchis wall and how to realise a window in it. Stai visualizzando gli archivi per la categoria Logbook.